The Milky Way structure model is helpful in visualizing the shape of our galaxy, and also our place within it. It shows the shape of the galaxy, the distribution of clusters of stars spiral arms, and other related celestial objects within a coordinate system. The importance of this model is to provide a visual concept of the galaxy in which our Earth is located as well as to provide some information regarding other objects within it. As with all of the models produced by Trippensee Planetarium Co., 90 years of producing models for educators has led to a series of products which are designed to last for many, many years, and which are made to be handled and used. An instruction book, The Milky Way Galaxy Model, is included with this model. Portable desktop Planetariums have been produced for over 90 years by Trippensee. They provide many visual demonstrations that clarify the relationships of the solar system elements in motion, for children and adults interested in learning more about the universe around them. 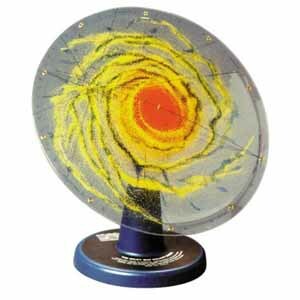 Perfect for school or as home planetarium.